Manchester City attackers Sergio Aguero and Raheem Sterling made Arsenal’s defence look like schoolboys this evening, this goal was put on a plate. 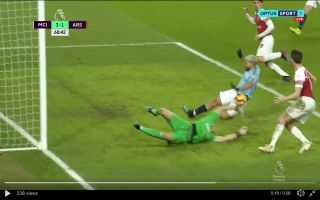 Aguero benefitted from a stroke of luck in the 61st minute, the Argentine lunged forward to tap the ball into the net but it was actually his midriff which helped the ball cross the line. The credit for Aguero’s third must go to Raheem Sterling, the England international danced past some of Arsenal’s defenders liked they weren’t there before putting the ball on a plate for Aguero. For City’s second and third goals especially, it looked as though Pep Guardiola’s men were just toying with the Gunners. To put it into context Sergio Aguero has scored a hat-trick by scoring two simple tap ins.